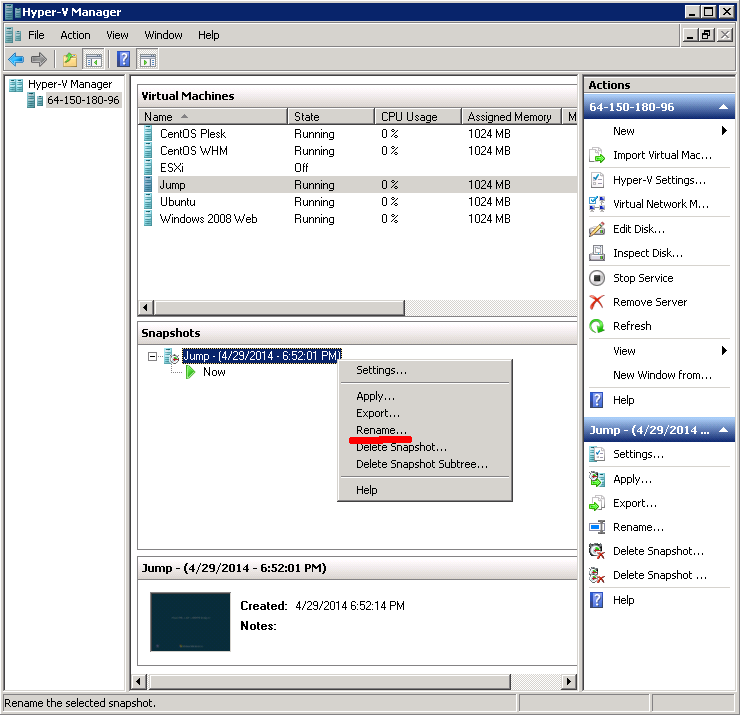 The ability to create snapshots is one of the best reasons for dividing your workloads into different virtual servers. If a specific service crashes, you can quickly restore it to a previously known setup with very little effort. I especially appreciate this feature when running a training class. 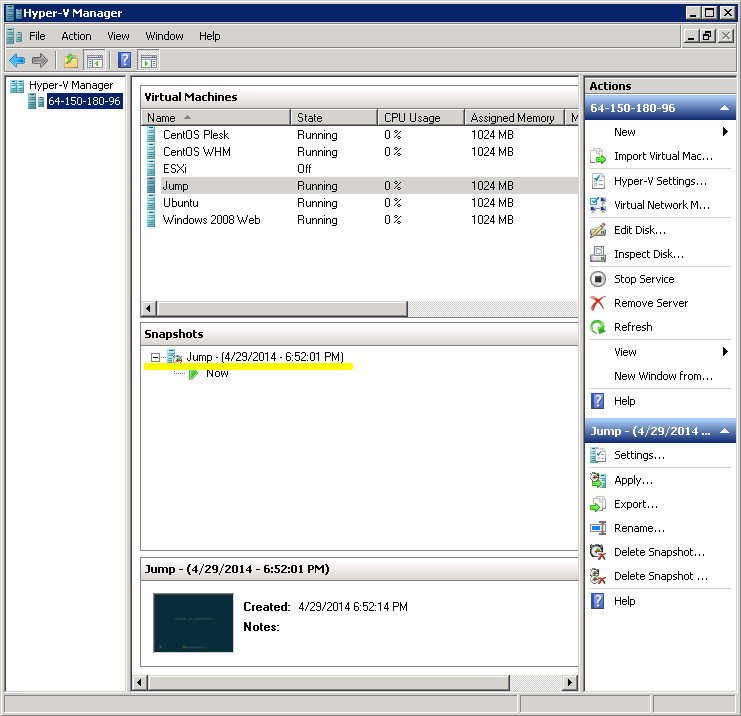 I can create a snapshot of a VM prior to class, then teach students how to perform certain functions hands on. In the event something goes catastrophically wrong (and it will! ), simply restore the machine to the exact condition it was in when the snapshot was originally created! Multiple snapshots can be created per virtual machine, so it is possible to restore a VM to any state you had created a snapshot for. 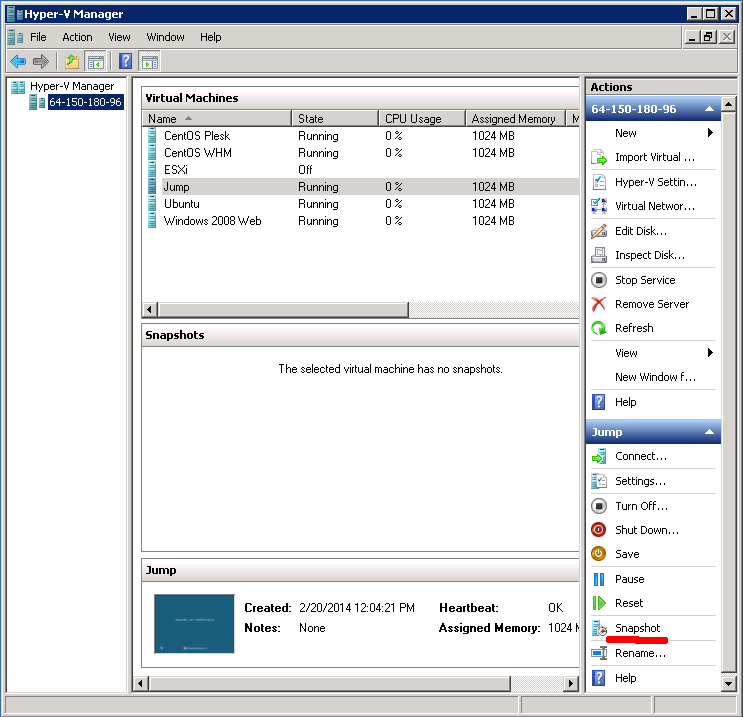 Once inside Hyper-V Manager, click the server name in the left column under “Hyper-V Manager”, then click on the desired virtual machine. For our example, we will create a snapshot for the Virtual Machine named “Jump”. Notice that in the center column under “Snapshots” there are no current snapshots available. Once you have created a snapshot, it will be listed here. The amount of time it takes to create the snapshot will vary depending on the workload of the VM and the amount of disk space it uses. Our sample VM is a simple Windows machine with just the basic operating system installed. Even so, this took several seconds to complete. By default, the snapshot will be named with the VM name, the date and the time the snapshot was taken, however you are more than welcome to change this. 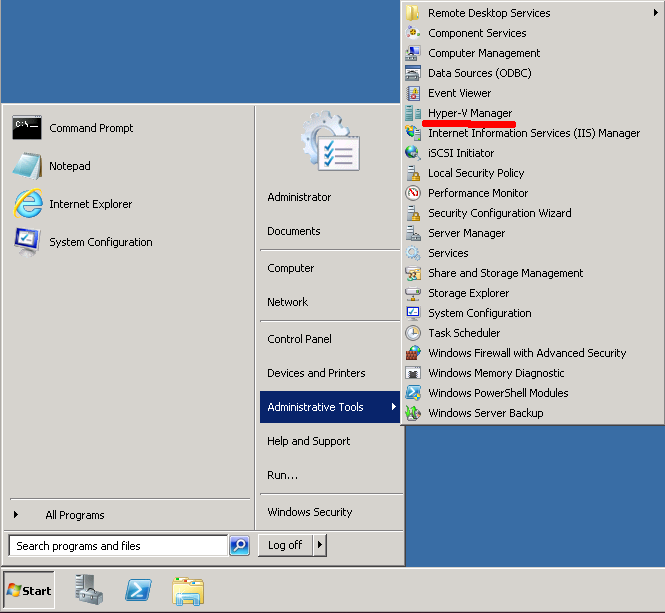 For our example, I have chosen “Fresh Windows Installation” for the snapshot’s name. If anything happens, I know I can return to this snapshot and have a fresh installation ready to go at a moments notice! You can create as many snapshots as you disk space to allow for. Simply repeat the steps outlined above. Each subsequent snapshot will appear under the current snapshot where you see -> Now displayed.